Crude oil inventories at Cushing ticked up slightly to 36 million barrels for the week ending on April 6, but still hovered near lows not seen in several years. Throughout the oil market downturn that began in 2014 and lasted through much of 2017, inventories at Cushing bounced around roughly between 50 and 65 million barrels. 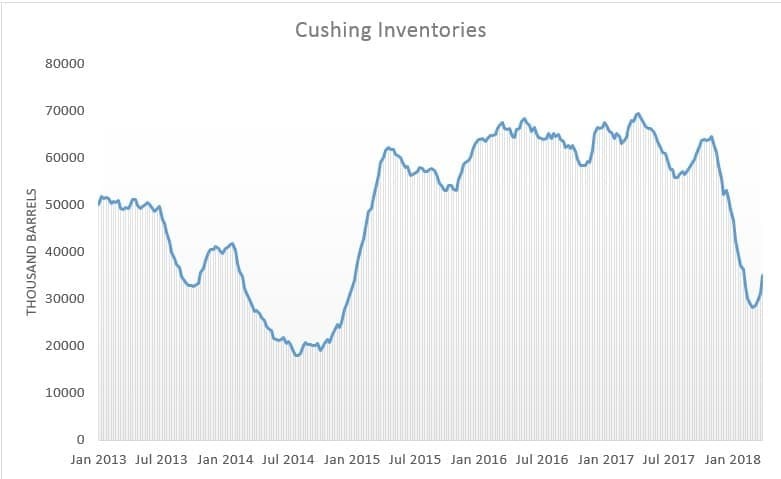 Cushing’s inventory levels have now been slashed by nearly half, a sign that the oil market continues to tighten. But there is more to the story. As Reuters points out, Cushing’s importance as an oil hub is rapidly diminishing. While there is of course some oil production in Oklahoma, Cushing’s significance has always been larger than a mere storage site. Cushing’s original importance was as a gathering hub for crude oil streams from all over – from various oil fields in different parts of the U.S., from imports coming from Canada and Mexico, and from elsewhere. As the “pipeline crossroads of the world,” Cushing’s larger significance was its role as the home of the WTI benchmark. But the physical oil upon which WTI is based is no longer moving to Cushing, at least not the way it did in the past. The oil hub is far from the coast where there are refineries and export terminals, and it is also rather far from the shale fields in West and South Texas. It’s not just that U.S. shale has burst onto the scene in the last few years and shifted the geographical landscape of production. Arguably, a more crucial factor was the lifting of the U.S. crude oil export ban, which for decades had trapped oil production within U.S. borders. Meanwhile, the Gulf Coast has also seen a dramatic ramp up in oil refining and petrochemical manufacturing capacity, a response to the surge in both shale oil and gas production over the past decade. Again, that means producers are trying to ship as much of their oil and gas to the Gulf Coast as possible. With everything flowing in the same direction, the Permian in particular is starting to run into bottlenecks, a problem that could yet slow the region’s supply growth. Several pipelines are in the works and when completed, they will solidify an even greater tie between West Texas and the Gulf Coast, diminishing Cushing’s importance. Genscape estimates that takeaway capacity from the Permian will jump by two-thirds by the end of next year, from 2.7 mb/d to 4.5 mb/d. Moreover, as Reuters notes, the Dakota Access pipeline started operations in 2017, allowing Bakken crude to bypass Cushing. In other words, the Gulf Coast is emerging as a more important oil hub than the one in Cushing, which will increasingly be cut out of the picture. U.S. oil production is sky-rocketing even as inventories in Cushing are at multi-year lows. While Cushing stocks currently stand at about 36 million barrels, a level of about 20 million barrels is effectively “empty,” according to Reuters, because a certain amount of oil must be kept on hand to blend with other grades as well as to keep infrastructure working properly.